Spasms of Accommodation: Speed of Light, Speed of Sound, Whatever! Speed of Light, Speed of Sound, Whatever! When I was a teenager I had the speed of light and the speed of sound saved in my HP-15C calculator. I'd written the constant in pencil on the face of the calculator next to the button where the number was stored. I used a subscript l for light and s for sound because both constants share the symbol c.
My professors often approximated these as 300 x 10^6 m/s and 340 m/s to plug into equations to see if the answer looked plausible. I had a pretty good grasp that these were very different speeds. Six orders of magnitude. That's a lot. But only if you know what an order of magnitude is. But there are still physical examples everybody should know. Thunder and lightning? Count the seconds to the thunder to know how far away the lightning was? We don't do that anymore? This past week has revealed to me that this distinction is lost on a lot of people working in media. Tweeted by @maggiekb1, with the caption, "MSNBC science desk has an embarrassing typo." retweeted by @TreeLobsters with the joke, "I'm shocked! Shocked, I tell you! MSNBC has a science desk?!" 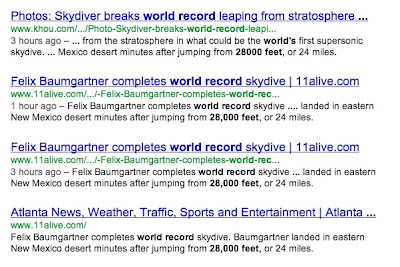 Sidebar: After the skydiving stunt on Sunday the AP released a story saying he jumped from 28,000 ft, or 24 miles. Well they left off an order of magnitude in that feet number. 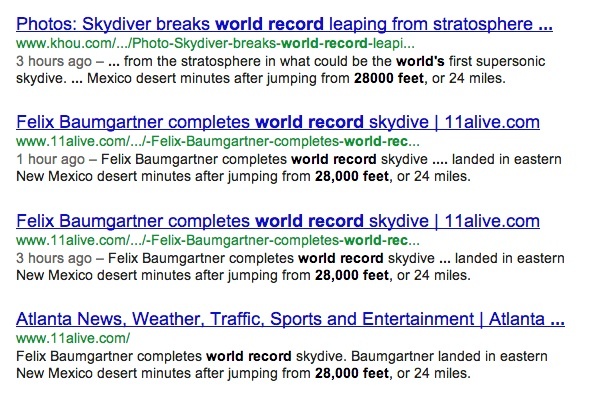 They quickly went in and changed their copy to the real number, 128,100 ft. But it was too late. TV stations all over the country had scraped that copy and posted it on their websites. A lot of them went back and changed it with no correction statement. A lot of them just left it alone. Here's a screen shot I made from a Google search Sunday. Back to me now: I was contacted last week by the Discovery Channel about my rocket video. Remember? The one where the rocket reached the speed of sound exactly when it passed through a cold dry/warm moist air mass transition? Refraction made the shock wave visible from the ground? They were interested in licensing this footage for all media in perpetuity. I was pretty excited because that sounds like a decent payday to me. Since the Japanese paid me $1000 to use it just once and only on TV, not the internet at all. But there were some red flags. The first person to contact me left a comment on YouTube. I sent her to my website to get my email address. She said "I'm brand new to YouTube." That seemed odd for a TV producer. A few days later I got email from a different person. The first woman isn't with them any more, so I have to start over. She wanted to know if I could prove I owned the video because she saw it first on Jokeroo and contacted them already about licensing. Umm, really? You don't know those sites steal everything? That's like contacting FunnyJunk for permission to use a comic by The Oatmeal. Also she used two spaces after a period. On advice from Phil Plait I asked for details about the show and who their expert would be to explain this stuff. When I got that information back I knew it was a dead end. We will be using the footage in our new series Alien Mysteries airing on Discovery Channel next year. The show candidly chronicles first person accounts of UFO sightings, alien encounters and abductions. In each episode real life characters take viewers on a suspenseful and often terrifying retelling of their bizarre, life altering encounters with forces from beyond our planet. Each story is backed by credible witnesses, investigative reports and tangible evidence. We turn to hard science experts (physicists, astronomers, astrobiologists, along with psychologists, and law enforcement officials) to probe the question: How is this possible? Your footage would be used to visually support the explanation one of our experts provides regarding the speed of light and sound and if an alien space craft could travel that fast. I don't want anything to do with a show about alien encounters. But just to be certain it wasn't a legitimate explanation of sonic booms, I emailed the expert she said they were using, an aerospace engineering professor at UT Austin. I was interviewed by the ######## ##### folks last spring. They are trying to figure out what happened with a UFO sighting at Stephenville, TX several years ago. I think that I was the “voice of reason” in their approach to the situation. I explained that the “UFO” sightings were assuredly not “alien” (in the “off-earth” sense) and were probably mistaken identification of earthly phenomena or deliberate fabrications. I looked at the problem of traveling to the nearest known “earthlike’ planet in the so-called Goldilocks zone – 600 light years away. If you accelerated at 1 earth g until you reached one tenth of the speed of light, flew at that speed until it was time to decelerate, and then decelerated at one g, it would take more than 6000 years for the flight. If Einstein is correct, the energy and time required for such a trip are far beyond reasonable for any beings. I was not asked about the sonic boom / halo occurrence. I had never heard of it until your note. So no, it was a completely illegitimate use of my footage. The expert never even mentioned the speed of sound, only the speed of light. Which, apparently to people in the media, are interchangeable. By this time I'd already sent the producer an email saying I was not interested in participating in their project. 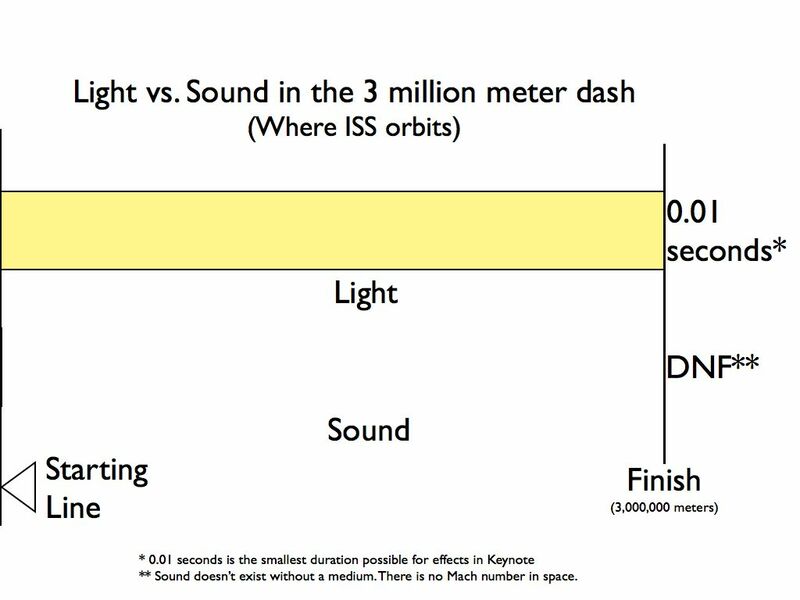 I wanted to make a chart to illustrate the distance light travels in a second next to the distance sound goes in the same time but Numbers won't let me make a column chart with more than 10 divisions on the height. I stretched one out to 180 inches tall by 4 inches wide and the column for sound hadn't even shown up yet. If I put it on a log scale that won't help illustrate it to anybody that doesn't already understand. 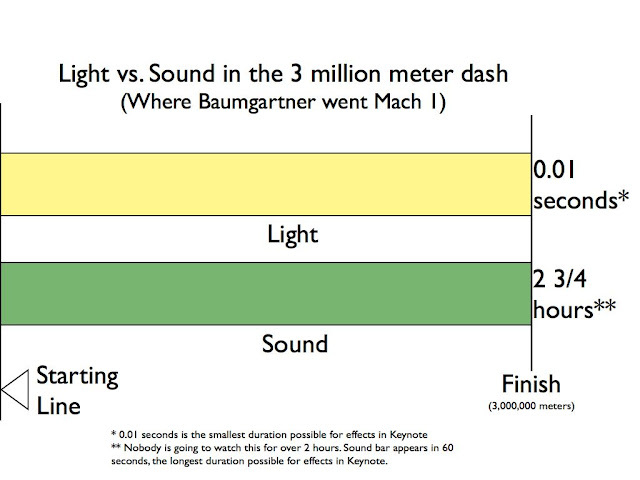 My next idea was to make a chart in Keynote using transitions to illustrate how much slower sound is than light. This could be a useful method for a teacher who is talking the whole time the slide is building. But a movie of that is just a giant waste of bandwidth. I truncated it to an animated gif. The speed of light in air is about 90 km/sec slower than in a vacuum. It makes no difference if you round it off to 300 x 10^6. In glass the speed of light is about 200 x 10^6. But the change in speed of sound matters a lot more when the medium changes. Light wouldn't really travel from Atlanta to Los Angeles because the earth would curve out from under it. If you put it in a fiber optic cable to bend it the speed is reduced. Sound would take 1 hr 36 min to travel as far in dry air at sea level and 20°C as light in fiber optic cable travels in 0.01 seconds. I did some other charts at the same time for other conditions. I didn't bother to animate these. I don't think my charts will help make it clear to ignorant people that speed of sound and speed of light are not the same. But MAKING the chart was sure a good exercise. This would be quite a good homework assignment for high school students. Go make a chart to illustrate the difference in the speed of sound and the speed of light. They should assign this in English class since these are the people that don't seem to get it. * Update. @ed_davies on Twitter disagrees with me that speed of sound goes up with density. 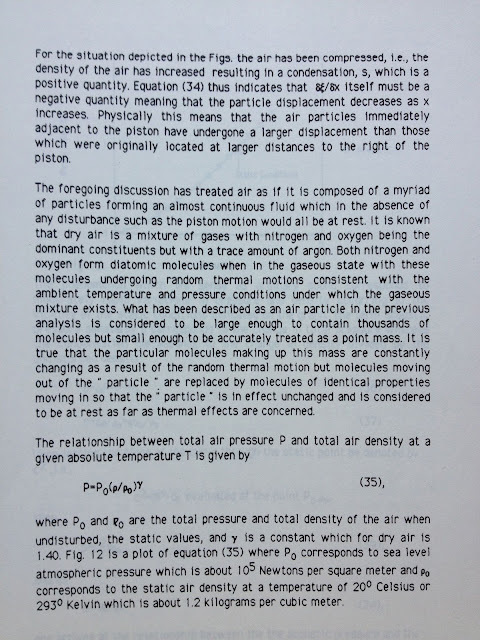 "Speed of sound in air is dependent on temperature, not density (mostly). 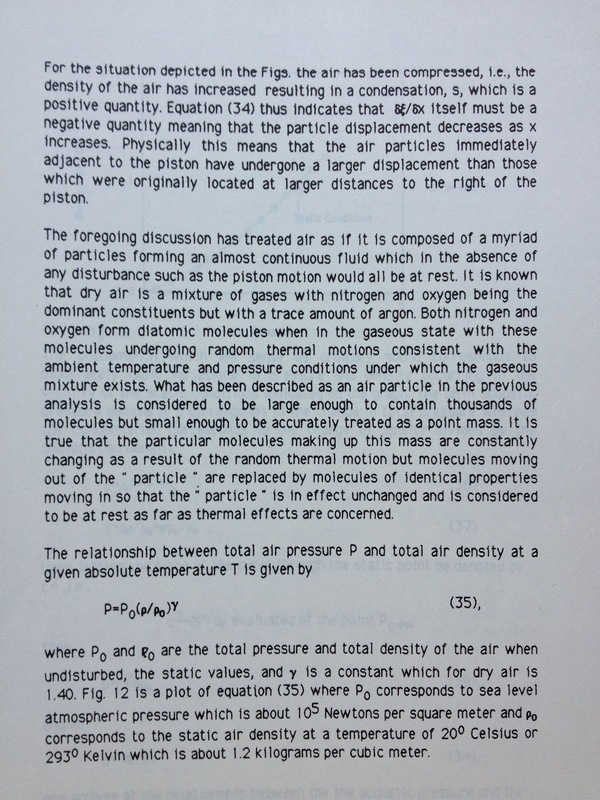 (with wikipedia link)" "Halve the volume of some air. P, ρ, T and c increase. Let it cool to original T. P & ρ are double but c is approximately original." I'm trying to illustrate that speed of sound is less than the speed of light, and as an aside that the speed of sound in the "thin air" at 100,000 ft is less than at sea level. 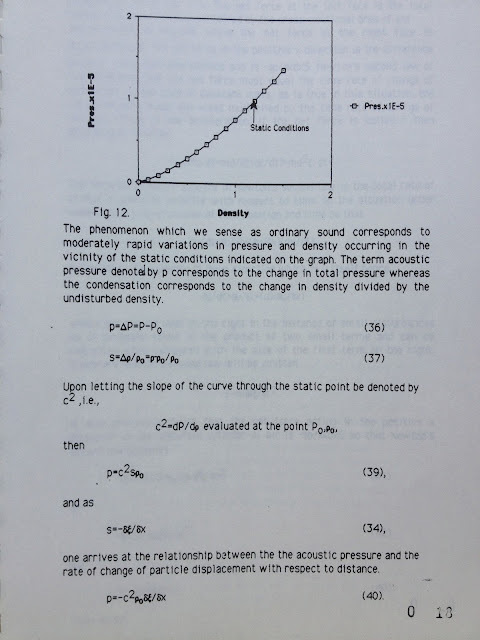 The nuances of the ideal gas law and acoustics are beyond the scope of this article. I am aware of the details of the physics and intentionally left them out. By using what's left of my memory of studying this stuff I'm trying to get closer to the stuff that laymen can understand. At this point even I struggle with my old college notes -- partial differential equations. If I get them out and mention all the conditions and exceptions like a scientist then the whole point is lost. Members of the media that don't understand light is faster than sound probably aren't ready for PV=nRT. I might have gone too far even using the word "density." If you want the details of all this the way I learned it Amazon is there for you. 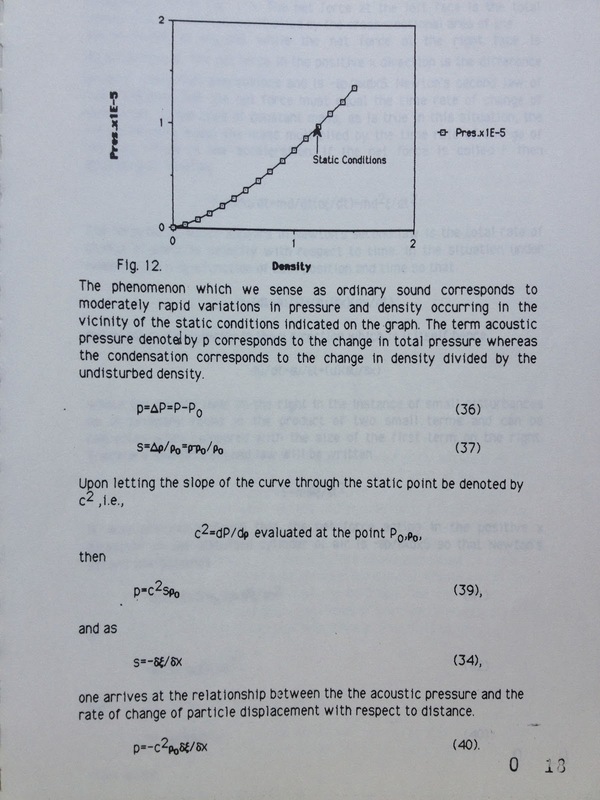 My acoustics professor, Dr. Eugene Patronis, just finished a new edition of his book, Sound System Engineering. 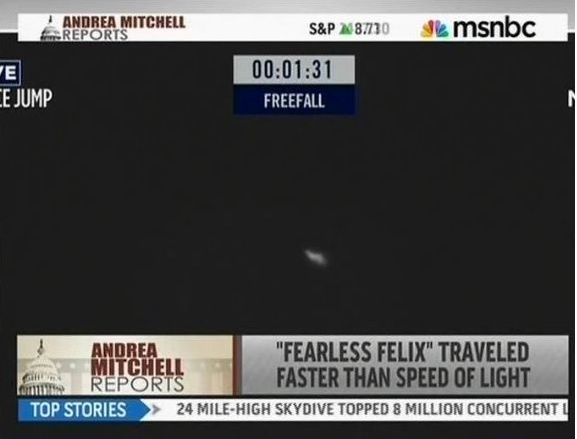 NBC could've been impressively correct if they were interviewing "Fearless Felix" after he landed while still showing live video of him falling. I bet satellite communication delay would confuse them if they ever put much thought into it.